My friend Jimmy and his son were telling me about this place and their overwhelming desire to try the Beefster, a burger stuffed with shaved roast beef, bacon, Swiss, horseradish drip. He knows how to get right at my desires as we went the very next day! Turns out that this burger stand is attached to the bar I used to hang out at when I first moved to NJ. 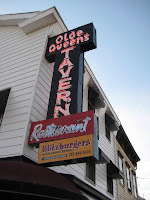 Olde Queens Tavern was half a block from my house in New Brunswick and had a $1 drinks happy hour on Fridays. The Blitzburger stand is outside, behind the restaurant and you can dine in or walk-up. Built in 1933, this local spot is a staple of the Rutgers College community. Blitzburgers has a menu broader than just burgers but with 30 stuffed burgers, why bother to order otherwise. Generally, I prefer a medium rare burger with cheese, onions and lettuce as a standard but as they say, when in Rome…It was a hard choice between “Sicilian Pizza Burger with Italian sausage, basil, fresh mozzarella,marinara drip” the “Fiery Chipotle Burger Cheddar and monterey cheese, fiery chipolte black bean spread” and the “Beefster Burger Burger topped with shaved roast beef, bacon, swiss, horseradish drip.” Since the Beefster was the original draw and our waitress was no help in tyring to choose, I decided to stick with it. The meal started with a complimentary bowl of popcorn and although I told myself I wouldn’t eat too much of it, we of course polished off the whole bowl. The burgers came with some crispy french fries and wrapped in wax paper. It’s Blitzburger policy to not cook below a medium, so I went with it. When the burger arrived, it was clear that these weren’t stuffed whatsoever, but merely that the extra ingredients sat between 2 patties, very 5 Guys Burger and Fries. The burger was decent but I can’t say the mix of 2 kinds of beef really did a whole lot for it. If there was bacon on it, I didn’t taste it but the grilled onions and horseradish drip were delicious. Overall, I enjoyed the sandwich but would order different upon returning. Adam, Tim and Jackie all got something different so check their individual thoughts on some of the other options. Maybe the free burgers on Fridays are better. This entry was posted in Burgers, Hamburgers, New Jersey and tagged best burger, bliztburger, burger conquest, cheese, ciancio, french fries, hamburger, new brunswick, new jersey, nyc, olde queens tavern, rev, review, stuffed burger. Bookmark the permalink. I have to agree with your review as I was pretty disappointed that “stuffed” actually meant two patties with toppings in the middle. However, I found the medium burger to be cooked to my liking (I generally like medium-rare) and the fries at a perfect crisp. Next time I visit Blitzburger I’m going to have to try something a little messier as the CA Burger (two patties, avocado, tomato, raw onions, lettuce, mayo drip) was just a bit too plain for me.